If you’re after an affordable Linux laptop, look no further. Yes, you’ll need to get used to the keyboard, and the touchpad is oversensitive – but for students, coding beginners and even children, the Pinebook is an excellent option that you should not overlook. 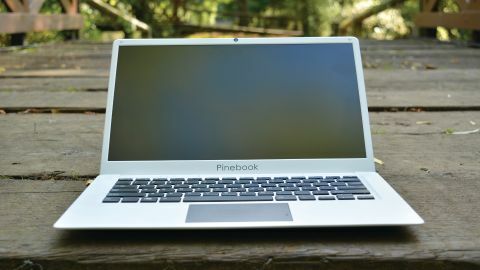 An Ultrabook with an ultra-low price ($99, which equates to around £75, so should set you back approximately £100 with shipping from the US), the Pinebook is the long-awaited laptop from Pine64. Like the Raspberry Pi rival Pine A64, the Pinebook is an ARM-based computer, and shares the same 64-bit CPU. Significantly, however, the Pinebook is currently the only ARM laptop on the market. Lightweight and narrow in a similar fashion to the MacBook Air, the Pinebook comes pre-installed with Ubuntu 16.04 LTS, complete with the MATE desktop environment. Other compatible operating systems include Debian Jessie, (the now defunct) Remix OS 2.0 and Android Nougat. If you prefer, your own choice of OS can be compiled from source. Weighing just 1.26kg and measuring 12mm at its widest point, the Pinebook can be comfortably slipped into most schoolbags and backpacks, and a few handbags and man-bags. Few Ultrabooks are as portable as the Pinebook, but battery life is a bit of a problem. At best, the 10,000mAh LiPo battery gives a maximum of 6 hours’ general use. On the other hand, the Pinebook will be recharged within a couple of hours. It isn’t a perfect experience. Upon opening the lid, you’ll notice that the centre of gravity seems to be high, with the display occasionally threatening to tip the computer backwards. Alongside the display, the lid houses a 0.3MP webcam, which is adequate. What sours the Pinebook experience, however, is the keyboard and touchpad. There’s a sensation that the human interface devices used are not of the highest quality. For example, the keyboard takes a lot of getting used to. It’s uncomfortable, initially unreliable (the spacebar on our review device was particularly temperamental), and will take a while to adjust your typing to. Some ergonomic tweaking and a better surface to the keys would help here. The touchpad is worse. Oversensitive to the point where it threatens the integrity of your work (for instance, selecting text when barely touched, or caught with a loose hair), it might be simpler to uninstall the device and use a wireless mouse. Pre-installed with the default operating system is a collection of useful (and somewhat expected) applications. LibreOffice is there, along with the Firefox browser… it’s Ubuntu MATE, and it feels like Ubuntu MATE. In fact, there’s enough here to make it feel as though you’re using a top-end computer. The shortcomings, however, come from the fact that you’re not. The ARM processor isn’t necessarily the problem. The real issue is that 2GB of RAM isn’t enough for a smartphone these days, so it certainly won’t do for a laptop. The Pinebook is short of storage, too, but at least this can be expanded via the microSD card up to 256GB. RAM shortages are frequent, and lead to process bottlenecking. You don’t even have to be running processor-heavy apps for this to occur. What results you get from the Pinebook really depend on your expectations. As a portable office device, it’s perfect, with a price tag that would attract most students. Ideal for programming, the Pinebook could make an excellent second computer for popping to a local coding session. Thanks to the work done by open source developers over the years, meanwhile, the Pinebook might also make a great retro gaming device. Or, with a price point in the same area as a low-cost tablet, the Pinebook could prove an ideal alternative computer for a young child, or any adult hoping to get online for the first time. Thanks to the ARM processor and low RAM, though, the possibilities of the Pinebook when it comes to intensive multimedia editing are limited under Linux. The alternative is to either buy a more suitable laptop, or put your faith in Android Nougat as an alternative operating system and hope that an app from Google’s Play Store suits. Even given the aforementioned shortcomings, being able to buy an ultraportable computer for around £100 is unprecedented, and there are so many uses for a spare laptop. While the build-to-order turnaround is slower than expected, it’s a small setback to get your hands on the most wallet-friendly laptop ever. (This review was first published in issue 185 of Linux User & Developer). Subscribe to Linux User and Developer today! Get an extra 20% off our Xmas subs deals using code: 20NOV. That’s up to 43% off PLUS an extra 20% off!